It should have a limit of draw per turn like a maximum of 3 cards draw or something. There, it would be less annoying. NEVER AND I MEAN NEVER! LET THIS GUY SURVIVE. UNLESS YOU HAVE LETHAL. 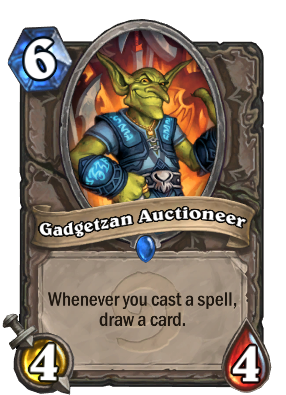 My main problem with this card is how BORING it is when it's played againt you. Just sit back , get some popcorn, and hope they don't draw well. This card is such a pain to deal with! Wouldn't call this card OP. As much as I hate to say it, it requires skill. Not true. A lot of times you're digging for an out if you have a bad hand, and much of the time you don't get it. It's not uncommon to draw minions when you need spells because you have nothing good in hand, just to face lethal the following turn. When Conceal was in Standard, I understand you. My go-to deck before Un'Goro was always Miracle Rogue, played it at every fireside gathering I went to, with around a 65% win rate. But I'm not a fan of the new build of the deck. It has potential, but it feels much less active to play, more like a control deck that has burst potential IF you can stay alive. If your opponent has a good hand it can be GG, but sometimes there's nothing there and it's literally play a coin or Prep and hope RNG and your remaining cards give you that chance at an out. Its effect is pretty broken, but without Conceal it's a 6 mana 4/4 half the time. Please help me i'm massproducing salt i don't know what to do. Most stupid card in the entire game with no doubt. The best part is seeing the pie chart on this one. It's almost exclusive to two classes and incredibly enough, druid is slightly edging out rogue. If I zoom my browser to 300%, I can almost see the tiny sliver of warlocks and warriors that are using it, and it makes me wonder who they are. Yeah, looks like rogue is beating druid now. Aww.